A brief introduction to gate hurdles and their uses and a look at the tools you will be using. Step-by-step you will produce each component of your gate hurdle, cleaving out rails and stiles, shaving tendons with a drawknife and cutting out the mortises with a drill and twybil or chisel. 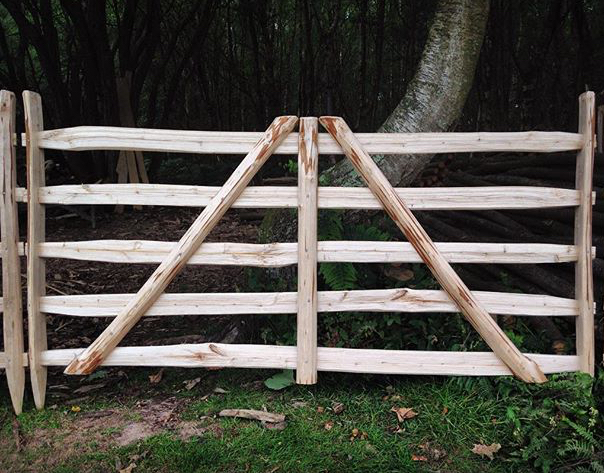 Assembly of your gate hurdle and making the diagonal braces to nail onto the rails. Ample time is allowed for you to grasp this craft, so if there is any time left over we can talk about how the processes and techniques you have learned can be applied to making other greenwood craft items. An informal, hands-on day in a small group learning and experiencing the joys of working greenwood using a range of tools and techniques at an introductory level. Course participants should be aware that sharp tools will be used and some activities will require reasonable physical input. Stout footwear must be worn, NO OPEN-TOED SHOES PLEASE! Please arrive at 9.15am for a prompt 9.30am start. Richard has 12 years experience running his own business making greenwood and coppice crafts products in and around the Battle area. Richard started out doing apprenticeships in 2005 with greenwood legends Mike Abbott (Living Wood) in Herefordshire and Ben Law (of Grand Designs fame) in West Sussex and has since worked full-time as a greenwood craftsman. Entitles the bearer to book a place on one of our £148 training courses. Simply purchase through our website to redeem in our shop.